We’re all familiar with the problem of overflowing drawers, crammed wardrobes and the dilemma of storing belongings that we don’t want to get rid of but may not need very often. In a perfect and affluent world we could just buy more storage units, but that’s not always an option. The alternative is to use the containers and materials we already have in our homes to create attractive and practical storage solutions. What sort of things do we need to store? There’ll be big things, medium things and little things. The easiest things to deal with are the little things, because recyclable containers to create attractive storage solutions are abundant in our homes. Among those, the humble glass jar is the answer for storing many small items. If you can assemble a bunch of identical jars you are halfway towards creating a good-looking storage system. You can use glass jars to store all sorts of things, from stationery items to household odds and ends like nails and screws. If the contents aren’t themselves attractive, a simple, pretty label on the bottle will obscure the contents but still let you know exactly what’s where. Visual repetition – as in a shelf of identical jars – is one of the secrets of attractive design. Of course, not everything will go in a jar. Don’t just chuck out those cardboard boxes that accumulate in most households. Keep those that are a handy size and of relatively good quality. You can cover them in pretty paper and even paint them with varnish to enhance them further. Cardboard boxes actually look great with just a couple of coats of clear varnish, and it helps to strengthen them too. With a selection of boxes of graduated sizes you can create stackable storage towers that don’t need to be hidden away. Old suitcases can also be jazzed up with a coat of paint, or decoupaged to create storage that isn’t an eyesore in the home. If you have any old wooden boxes, or even a broken chest of drawers, then you have a versatile storage solution almost ready to go. Wooden boxes or drawers, tidied up with a coat of paint, are ideal for mounting on walls, as display and shelf units. Find interesting fabric panels and glue them to wooden crates, then give the whole thing two or three coats of clear varnish inside and out for a quirky and unique storage unit. Baskets of all descriptions are also perfect for storage. 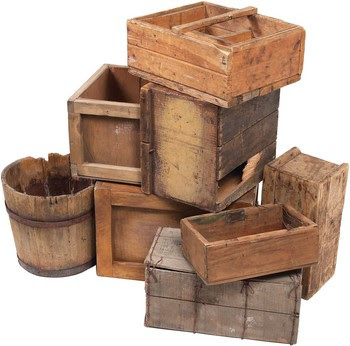 These too can be brought back to life with a wash in soapy water or a coat of paint or varnish, to serve as storage containers anywhere in the home. Storage is all about keeping things out of the way. A row of round doorknobs mounted on a plank, that is in turn hung or mounted on a wall or the back of a door, will give you a place to hang all sorts of things. You can find interesting door knobs at your tip store or search garage sales and trash’n’treasure markets. To make the most of it, hang cloth drawstring bags from the knobs. Old pillowcases are easily converted into bags with ribbon or suitable string. It’s all about thinking laterally and doing a bit of handiwork. Tune in to recyclable objects and all sorts of household items can be converted into useful storage solutions. I am Ryan , a financial blogger and I love to write financial articles on different financial topics . My favourite topics are personal finance , savings , debt , mortgage , credit , Budget, stock & frugal living tips. My job is to write financial articles for different financial sites to explore their presence in the web with the help of my writing and for that I was searching for some quality finance blogs in the web when I got your blog http://www.debtfreecashedupandlaughing.com.au/ in the search results. I like the way you represent your contents to your audience and I am very impressed with it . I'd be more than happy if you can give me a chance to write for your wonderful blog to seek some attendance of your audience. My post will be 100% unique and if you want you can also give me your own topic and the word limit for it and I will give you the content as per your requirements. I also promote my posts to my social network to get some more exposure and your site will also get a good value by it with my post. Please get back to me at : ryan(dot)financialwriter(at)gmail(dot)com if it's sounds interesting to you.